Looking for That Perfect Last-Minute Gift? Buy Local and Support Detroit. The holiday season has shifted into high gear, and Detroit’s crafters and artisans -- and bigger businesses -- all have products meant to capture our love of the city. There are ties and caps, towels and prints, cards and jelly and shirts galore. The city just hosted a new tradition in the Detroit Urban Craft Fair, and other similar events will take place almost daily as the city counts down to the 25th and beyond. While we couldn’t mention every item we saw at the craft fair -- and even earlier, when we hit up Eastern Market After Dark as part of Detroit Design Festival -- we’ve curated a list suitable for most budgets, especially if you’ve been saving for your ultra-hip friend. Angie Coe, a local artist and illustrator, uses her east side neighborhood as inspiration for her designs. We love her Detroit motto print -- "We hope for better things" -- as well as a charming tea towel, both decorated with pheasants, the city’s unofficial avian representative. 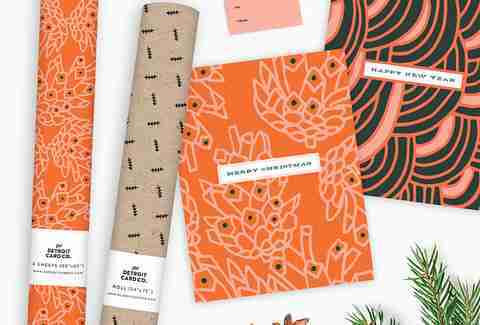 Detroit Card Co. is another homegrown Michigan paper goods purveyor offering Detroit prints, cards, and gift wrap designed by shop owner Genna Cowsert. The shop has holiday cards wishing you warm greeting from the Great Lakes, too -- a must-have for last minute holiday card lists. These pieces say Detroit, and say it at solidly Detroit price points. Nothing says Detroit like Faygo, from the glass bottles proudly on sale at Cinema Detroit, to the sticky Juggalos dancing in the froth of grape and orange and cherry drinks sprayed on them from any stage that ICP performs on. 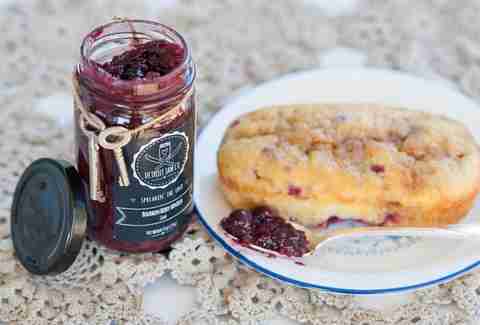 Detroit Jam Co. makes a version far more useful to holiday breakfast makers. Among the many flavors of jams and jellies -- from traditional flavors like ginger peach to savory choices like onion and tomato -- you’ll also find a wide array of Faygo and Vernor’s infused delights. You can buy a collection of three of the soda jellies for $25, or stick to one for $9. Flavors include Faygo black cherry, Faygo cream soda with raspberries, and Vernor's ginger jelly infused with cranberries. 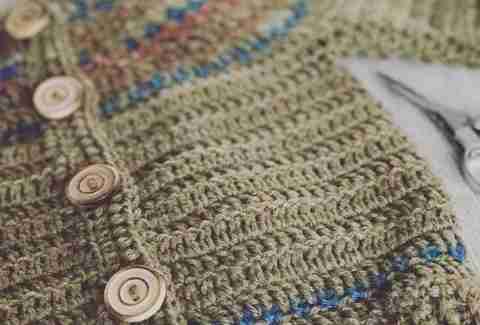 We found this local purveyor of hand-made yarn crafts -- think mittens, scarves, hats, sweaters -- at the Detroit Urban Craft Fair. One item we couldn’t stop touching were the company’s adorable hats, made of wool and pima cotton. The baby hats, complete with a wood tag announcing the cap (and, we suspect, the babies who will wear them) as “Mitten Made” highlight the script “D” for Detroit in the logo. Adorable. Local artist and cat fancier Kill Taupe offers what we suspect is the most Metro D t-shirt of all time. For $28, you can tell the world your spring, summer and fall plans… now, during the bleak depths of winter. 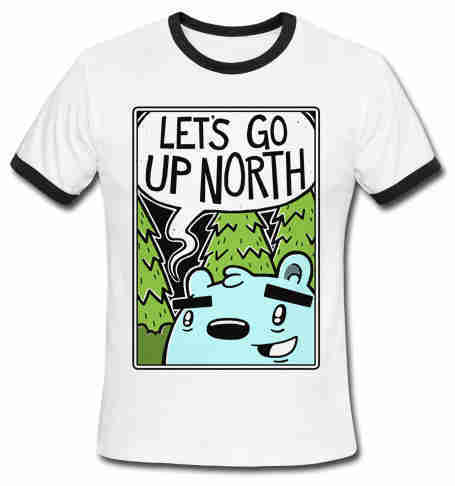 That blue bear has it right: Let’s go Up North. But in 12 weeks or so. This maker also has plenty other irreverent tees, enamel pins, magnets, prints, and other accessories for those who like to wear their sass on their sleeve (or lapel). The 10-year-old Detroit maker of cravats, bows and long ties, and scarves has hand-painted nearly a million ties in a gorgeous, light-filled studio near Eastern Market. Specializing in water-based inks and other environmentally kind products, the company founded by Cranbrook grad Bethany Shorb sponsors internships for area teens and offers its products to help homeless individuals transition to into the workplace. 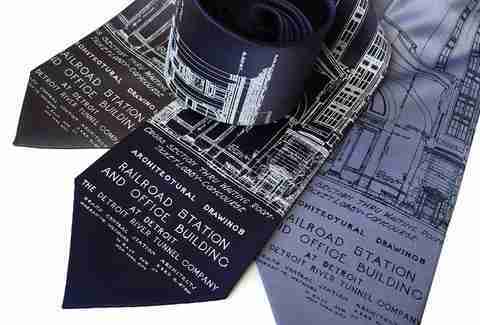 Cyberoptix hones on its D cred with a blue silk number featuring architectural renderings of Michigan Central Station. 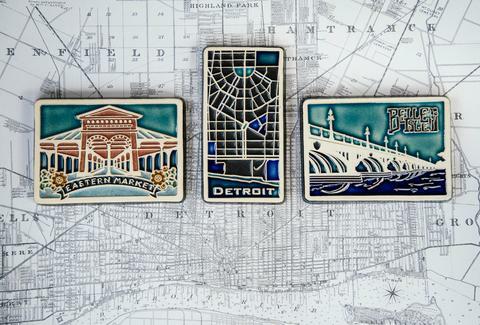 Detroit’s famous ceramics studio offers ornaments, serving pieces, and signature tiles featuring some of the city’s most famous locales, including Belle Isle. Our favorite piece this year is the Pewabic pint. The hefty stoneware vessels hold 16oz of your favorite winter beverage (we like a good Christmas ale, but also think cocoa is best when you drink 16oz at a time). They come in cinnamon, leaf, and moss (aka, red-ish, green, and grey), and at $60, make for a nice investment in collectible crafts. If you get a new one each year, your holidays will be extremely merry, and not just because there’s beer involved. When you’re looking for a quilt that’s also a map of the Great Lakes, Detroit Mercantile has it covered -- pun intended. The 52″x72″ deep blue poly-silk quilts are hand-appliqued by Haptic Labs in, of course, Brooklyn. We hear Brooklyn is great if you can’t find a place in East English Village, but if you can’t go there, head to Detroit Mercantile’s Eastern Market digs. You may come for the quilt, but the vast collection of Detroit apparel, stickers, totes, scarves, and jewelry has something that screams Michigan for every budget. While few people think “Detroit” and “surfing” are words that effortlessly go together, this 10-year-old company defies those expectations with its line of surfboards and paddleboards. While those items work well on Lake Michigan, Detroit Surf Company’s skateboards may be the more practical option for city use, and the snowboards are another fun gift to consider for those headed to Boyne or to skiing destinations even farther north. 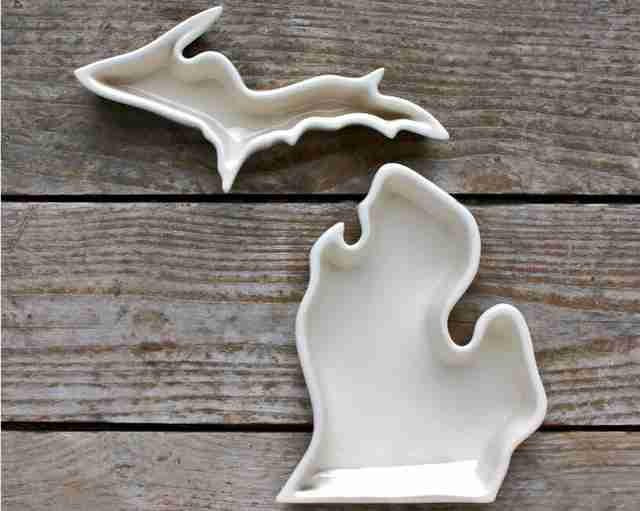 Every item is also proudly handmade in Detroit, and showcases local design in an elegant, practical way. It’s wood. It’s stainless. It’s sleek. It’s expensive. There may be better ways to tell the world you’re a rich hipster, but we really can’t think of any that send the message quite like Shinola’s new, decidedly nice-looking record player. Crank up the vinyl on watch-and-bike maker Shinola’s first audio product. Described by the company as the perfect item for the “discriminating audiophile,” the Runwell offers built-in a phono preamplifier and has a belt driven pulley capable of delivering the best of Motown -- we like to imagine -- at a steady 33 1/3 or 45rpm. 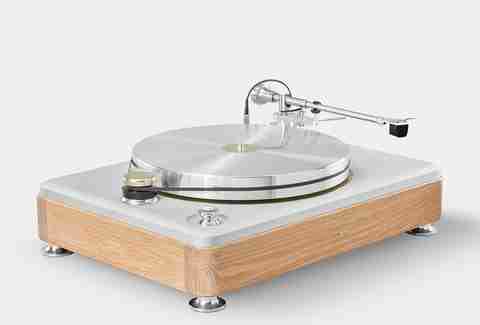 Shinola will only make 500 units in the initial run, so these may be as collectable as the records you play on them. Rebecca Golden lives and shops in Detroit. Check out her weird holiday pix on Twitter @GoldenReb.